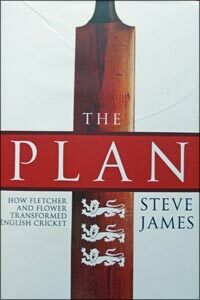 Steve James was a stalwart and highly dependable batsman for Glamorgan and, judging by The Plan: How Fletcher and Flower Transformed English Cricket, he appears to have the same talents as a writer. With cricket writing encompassing many, many aspects of the game we should not be surprised that a book detailing England’s rise from their nadir in 1999 when they had sunk to bottom of the Test ratings to the top just over a decade later, should come out. Steve James is the ideal man to write such a book having been with Glamorgan with two of the men instrumental in England’s rise: coach Duncan Fletcher and ECB Managing Director, Hugh Morris. James’s occasional self-deprecating comments about himself, though, do not hide the fact that, like Morris, they were both formidable county players who, in the more recent past, might have represented England far more than their combined five Tests. Between them, they scored 100 centuries for Glamorgan. James’s style makes this an engrossing book. He is not averse to mentioning aspects which, at the time, he thought were incorrect and happily admitted that he was wrong. Neither does he mind putting his views across. Having assisted Duncan Fletcher with two previous books, James is in an excellent position to extol the virtues of the coach who started the renaissance and show him in a different light which many readers may possibly not have seen or believed. Above all, he seems fair in his praise and criticism. Due to the nature and indeed subject of The Plan, I am very pleased to see Hugh Morris’s talents as the main administrator being acknowledged. Having been at school with Hugh, it was noticeable then that he was not only a quite exceptional cricketer but also a most impressive person and I am not in the least surprised by James’s comments about him as a person and glad to read them. James’s mention of Hugh’s serious illness is moving and many of us were so pleased that he has made a full recovery. One hopes that Hugh, a thoroughly decent person , has enjoyed the just desserts for his hard work as the man in charge of English cricket. James details how events changed for the better under the first of the two Zimbabwean coaches, Duncan Fletcher, before finishing with the second and current coach, Andy Flower. He also discusses the tenure of Peter Moores and the difficulties experienced during this period. What I find makes the book so readable is the use of many experiences, anecdotes and opinions from both James’s playing and journalistic career which certainly adds to the book and many people have been interviewed to give an excellent balance on the main people involved in England’s rise. There are no photos in this book but what we do have is an excellent account of what has gone on behind the scenes to make England the current No 1 Test team. I would imagine that, what James has written within this book is not readily available in book format and we learn a great deal which makes this a fascinating read. When I found that Steve James had written this book I suspected that he was in the ideal position to chart events from 1999 onwards and Sidney from Lydney, as Fletcher called him, has produced a tremendous book in eminently readable fashion.